Make the game more "realistic" in terms of lore while keeping playability but different balance, therefore all units' scale, range, line of sight and stats are adjusted to fit this. I also made buildings more expensive but stronger, modified many abilities like the Nuke to be (a lot!) more devastating and added the Planet Cracker to the Mothership. Almost all air units (mostly fighters) have strafe style weapons (like interceptors), also adjusted many units' movement, cost and other stuff. All capital ships are bigger and rebalanced. Still feel to strong but hey, "realistically" that's how they're. Any sugestions that follow the concept of the map will be addressed. This game has a working AI for the custom units and spells. -Realism and scale on units/buildings, movement, speed, stats costs supply etc. -Include almost all campaign units (wich were worth including) from WoL, HotS & LotV. -Basically rebalanced all the game due to all stats and weapons changes. -New weapons, behaviors, abilities and buffs. -Try to make several strategies viable. -Make the game focus more on battle & base defense than resource harvesting. -Try to give the feel of cheap mass units and some special expensive units in the army composition. -A tactical feeling, units movement affected by terrain, small units can evade some attacks by beeing hard to hit. -Weapon effectivity, small weapons fire do almost nothing to high armor. This Mod is based on (but adjusted for playability) on Xiarobear's Starcraft scale charts ( Xiaorobear.deviantart.com ) and also contains several custom units from the map community. Special Thanks to GhostNova91, Hammer, Solstice & SoulFilcher for the models, icons and wireframes and Kailniris2 for awesome bridges and custom battlecruiser! Alex06, Rikki333, for the icons, TooMuchTuch for decals, Thrikodias(Forsworne), CybrosX & Gradius for great models and textures, Flink links for icons and wireframes, XLIIVI for some amazing abilities and to all SC2 Mapster community for different spells, tutorials and ideas wich made this possible. Hello everyone, after long waiting I've finally released the Extension Mod for SCII RS melee games, now everyone is free to play this mod with your friends and AI on any map you like. The mod is currently on all servers and available for LotV expansion levels. I'm working on a HotS & a WoL's only mod but sadly, due to Blizzard's user rights it will only contain those campaign units contained on each expansion level. If you guys want all units, you'll have to get LotV or team up in a party with a friend with the expansion and have him search for the mod so you all can play while in a party with a LotV user. Even though it's somewhat a final release (which means it won't have any mayor updates anymore) I'll still support this mod and release any patch required by the comunity in terms of bugs or glitches, again, it's not supposed to be balanced as starcraft lore is NOT balanced; so any balance suggestion will only be taken into account when backed up by lore or when it posses a significant gaming issue. - Heart of the Swarm & Legacy of the Void units, models, abilities & upgrades are included. - Units size, movement, speed, range, cost & several other stats have been heavily modified so they fit closer to the lore. - Structures are stronger to accomodate lore balance. - Most fighter-type units have changed their weapons into strafing weapons to increase air battles realism. As a result of this, antiair weapons have increased range and several capital ships have improved antiair weaponry. - Capital ships are still massive but had their size a little reduced due to gameplay issues. Still incredibly powerfull though. 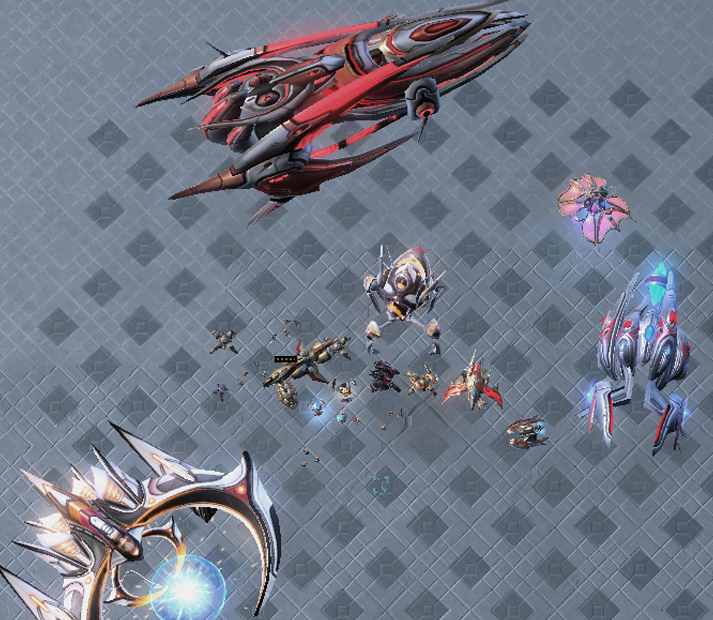 - The Dark Protoss upgrade has been moved to the nexus and changed into the Tal'Darim upgrade, according to LotV's lore. - Several new custom upgrades have been added in order to keep game improvement, some kind of lore balance & include the overall idea of each race's researches. - Several abilities have been heavily modified and some are incredibly powerfull and dangerous like the Nuke & the Planet Cracker. Next, I'd like to extend my deep gratitude to all SC2 Mapster community, I did not make any of these models, there are several great artists there and withot them I wouldn't have been able to develop this mod. Last but not least, I'd like to ask the community to try out the mod and give me your feedback, I'll be working on my custom campaign, which uses this mod as a basis, so any improvement that can be made will be more than welcome. * As a side note, there are a few units in the screenshots that are not currently on the melee mod because they're meant for the custom campaign like most of the battlecruisers, you might want me to add them to the melee mod; if this is the case please post it here while keeping in mind that some will not make it to the melee mod (again, battlecruisers) as they are incredibly overpowered, redundant, etc. New update preview. Soon-to-be-released. 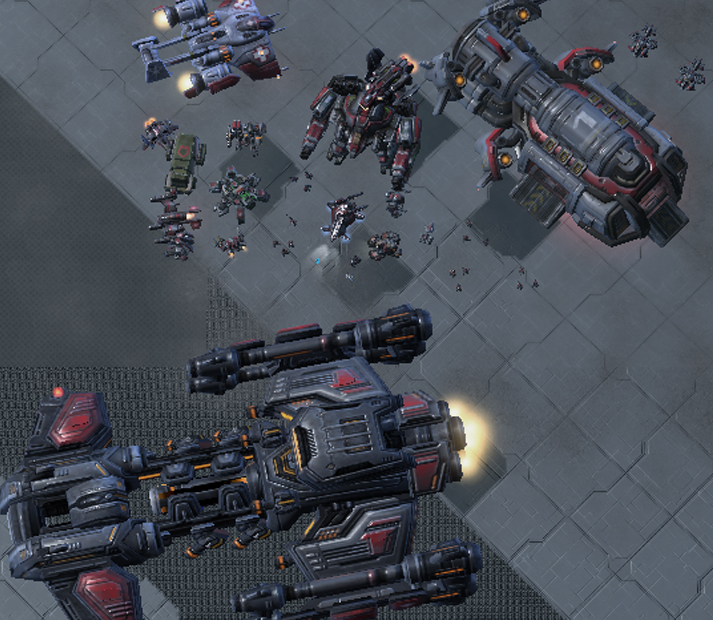 Includes LotV and custom units thanks to SC2 Mapster community. Next week I'll be publishing new features. How do I search for the mod ? Were you able to find the game in the launch with mod thing?